Use the links below to read of the healing many have found through the Rachel's Vineyard experience. Click here to tell your story. I was so blessed to attend a Rachel's Retreat. That weekend allowed me to "Feel Again". I did not realize, how I continued to punish myself by not allowing myself to feel emotions. I thought I did not deserve to cry when things happened in my life because of what I did in the past. So, whenever I experienced pain I would not allow myself to show emotions or feel. I learned to forgive myself and allow God to heal me. I am learning to communicate my pain to others. When ever I am hurt by others I would shut down and push the pain down on the inside. I was hurting and there were women who did not know me, but I felt genuine God's love for me. They allowed me to talk as long as I needed to. The retreat saved my life. Now I am "feeling again". I feel God's presense and love. It is amazing. Thank You. I was twenty-four years old, a single-working mom, an enlisted member of the Naval Reserve, and a full-time college student when I met my ex-boyfriend, Andre, in October 2000. He was and still is an active duty Air Force officer. During the course of our relationship, I left the Naval Reserve in December 2000 and transferred into the Oklahoma Air National Guard. He had some reservations about dating me because of our respective statuses in the military. There is a rule in all branches of service that commissioned officers are not permitted to date enlisted members. Because of his reservations, we dated off and on for six months. And at that time in my life, my relationship with God wasn't where it should have been. It was close to Easter 2001 when I thought I might be pregnant. I had been experiencing symptoms of starting my monthly cycle; however, I knew the symptoms I had could also be an indication of pregnancy. Despite being on hormonal birth control, I couldn't recognize the difference between the two. After giving birth to my daughter in 1998, I didn't have a regular cycle. It was a beautiful April morning when I decided to take a home pregnancy test. I called Andre to let him know I was going to do so. I was supposed to leave work to attend my intro to psychology class, but I left to purchase and take the test instead. When I took the test, it registered a positive result, instantly. I was in shock! My daughter wasn't a planned pregnancy. Her father and I married in 1997 because of her. Since I made the same mistake twice, I didn't want to tell my parents. I knew it would have greatly disappointed them. I called Andre at work to let him know the result of the test. He left work immediately after we hung up the phone to meet me at my apartment. After his arrival, we talked for at least half an hour. He stayed with me for a few nights so "we could figure out what to do". We discussed several options. He said the only way he wouldn't consider the abortion was if I requested a pregnancy discharge from the 'Guard. He knew that I had recently enlisted in the 'Guard, and I told him there was no way I was giving up my military career for him. It was at that time he coerced me into aborting our child because he didn't want to get in trouble for having caused an enlisted woman to become pregnant. That left me knowing my relationship with him was through. It also left me knowing that I was the only one who wanted to protect this baby. I made one appointment for the abortion and cancelled it. I later made another one, which resulted in the death of my second child by dilation and suction curettage on May 4th, 2001. The day of the procedure was utterly one of the worst days of my life. Andre took the day off to take me to my appointment at the abortion clinic in Norman. I don't remember a whole lot about that day, but what I can remember, I will never, ever forget. There were several women and girls in the waiting room when we arrived. I checked in with the receptionist, and she gave me a cup to give her a urine sample. After providing her with the urine sample, Andre gave me the money for the abortion, which I also gave to the receptionist. After waiting for roughly fifteen minutes, I went in to an exam room to have my vital signs taken, and then I returned to the waiting room. Five minutes after that, Andre and I met with the doctor. He asked us if we were sure if this is what we wanted to do. My heart kept screaming NO, but my mouth betrayed my heart and out came the solitary word that would change me for the rest of my life--yes. And of course, since Andre was the one who wanted the abortion, he said yes. After the discussion with the doctor, I was taken into a recovery room to get prepared for the procedure. From there, I was led into the abortuary suite by the nurse and the doctor's wife. When the nurse tried was trying to put the IV for sedation in my arm, she had a very difficult time getting the needle into my vein. She had to take me back to the recovery room and wrap my arm in a hot towel to get my veins to surface. I was, then, taken back to the abortuary suite. I remember asking the doctor's wife, before the nurse successfully put the IV in my arm, if God would forgive me for what I was doing. When the IV was finally in, I began counting backward from ten, and the next thing I can remember is waking up in recovery crying for my daughter. To this day, I hate having my blood drawn because of my experience in the abortion clinic. After I was released, Andre and I went to eat lunch before he took me home. He wanted to stay with me to ensure I was OK, but I told him that it wouldn't be a good idea because my ex-husband was coming over so I could see my daughter. n April 2002, I was exploring my options of returning to active duty with the Air Force, so I could provide a better life for my daughter. In June 2001, I met the career field manager for Medical Supply when I was in technical training. (I re-trained out of my primary career field, Information Systems Technology.) I called him to inquire about active duty positions in the career field. His research resulted in putting me in contact with someone who could assist me obtaining a more permanent civilian employment option in medical supply, rather than my returning to active duty. As a result of this contact, my daughter and I relocated to San Antonio, TX in August 2002, when I accepted a contract position working at Wilford Hall Medical Center at Lackland AFB. I also transferred from the Oklahoma Air National Guard into the Air Force Reserve so I wouldn't have to drive eight hours to attend my guard drills. It took the three months I lived in San Antonio and sharing my 'secret sin' with my dad and step-mom to realize moving there was not where God wanted me to be. The other realization was I made that decision so I could get away from Andre and the bad memories surrounding the end of our relationship. When I returned to Oklahoma in November 2002, I returned to my primary career field. During that time, I served on two voluntary tours of full-time duty from November 2002 until June 2003 to obtain training from my reserve unit and to assist an active duty unit at Tinker. Very shortly after my return, I saw Andre and his new wife at the Base Exchange when I was having lunch with one of my co-workers. This brought back a flood of memories and heart-wrenching grief. The effect of seeing him caused me to begin an extensive research on the internet for post-abortion healing. The result of my research led me to Project Rachel and Rachel's Vineyard. The weekend of January 17th, 2003, I went on my very first retreat. By going there, it allowed me to grieve the loss of my child. After much soul-searching and prayer, God revealed to me that this baby was also a little girl, so I named her Harmony Rachelle. Unbeknownst to me, the beginning date of my retreat would have profound significance for me a year later. Going on the retreat reaffirmed my faith in God, but I was still confused and hurt. I couldn't understand how this man, whose actions were unbecoming of an officer and a gentleman, was allowed to remain in the Air Force. This was also the same man who claimed to be a Christian when we first met. My answers didn't come until a year later. On January 17th, 2004, I married the love of my life, Damon. We met while we were both assigned to the Air Force Reserve unit. (He is still in the AF Reserve, and I left the AF Reserve in March 2004.) He knew I had been struggling to work through the "whys" I had about Andre. It was by his gentle direction that he suggested I should talk this over with our chaplain at Tinker, who married us, and to the pastor of our church off-base. Our chaplain told me I shouldn't worry about Andre's military career and to be content to know that 'his sins will find him out'. He also informed me that he had previously counseled someone in a similar situation, and the officer of that particular situation lost everything. The pastor at the church we'd been attending off-base told me that because of the devil's lies, I was bringing condemnation upon myself. He reminded me I needed to forgive myself because God had already forgiven me when I asked for it at Rachel's Vineyard. I also shared with him that Damon and I wanted more children in addition to our daughter. He expressed that a new baby will be a physical reminder of God's forgiveness and trust in me. The Lord has an interesting sense of humor! Damon and I found out on December 22nd, 2004, we were expecting our first child. This was also the day Harmony was due to arrive in 2001. No sooner did we find out about this precious gift, we lost our little one nine days later on New Year's Eve. We believe this was God's way of letting us know that we are able to have children, but it wasn't the right time yet. My faith in God has become stronger through this experience, and He has shown me areas in my life that needed some work. While I had finally forgiven myself for allowing to be coerced into aborting Harmony, I still needed to forgive Andre. Damon and I had gone to Wichita Falls, TX on February 27th, 2005 to pick our daughter up from her dad's. We had a very interesting conversation on the drive home while she was taking a nap. I told Damon I had heard the Lord speaking to me about this 'forgiveness issue' I had and the need I had to call Andre. Damon told me if calling Andre didn't have a negative effect on me, he wouldn't have a problem with my calling him to get closure. I contacted Andre the next day at work. We had a pleasant conversation. When we discussed our abortion, I told him I forgave him. During our conversation, I also informed him that I was now happily remarried to a wonderful man God brought into my life. After that first conversation, Andre and I didn't speak again until a month later. I told Damon that he had contacted me at work by e-mail. Damon didn't have a problem with Andre e-mailing me as long as it helped in my healing. Unfortunately, Andre took advantage of my forgiveness toward him and manipulated my feelings of friendship for him by attempting to turn them into something else. Once I realized what was happening, I put a stop to it immediately and asked our Lord's and Damon's forgiveness of my actions since I was not fully aware of what was happening. I thank the Lord every day for my Godly husband who stands by me and who has helped me work through my feelings from this tragedy. I have been thinking a lot about the past few weeks regarding the e-mails and phone calls that have been exchanged. I finally came to realize it's not healthy for us to continue our friendship. Truthfully, I feel like you've taken advantage of my generosity and ruin something beautiful out of my forgiveness toward you. Just because I've forgiven you does not mean that we should pick up where we left off. With the e-mails previously exchanged, I feel like I've been in a fantasy world for the duration, which has been completely unfair to my husband, my daughter, and to me. I feel the healing I've done from the situation we were in has been flushed down the toilet because of it all. While you say "you're sorry" for talking me into aborting our child, I feel like you don't and categorically refuse to acknowledge her. Regardless of your feelings, Harmony will always be your first and my second child. The child Damon and I lost will be my third. You need to focus on getting your relationship right with your wife and take care of your daughter. It isn't fair to your family that you are seeking me and other women out to do inappropriate things with. Your actions are unbecoming of a Christian, a military officer, a gentleman, and not to mention a husband and a father. Damon and I attended Rachel's Vineyard together from June 1-4, 2005. It brought me to a new level of healing and place of hope. Damon has supported me from day one to help me work through the feelings of my loss. He discussed how hurt I was by Andre's rejection of Harmony with the leader of our retreat. It was during this time, it was suggested that he ask my permission to spiritually adopt Harmony. He asked me, and I agreed. Since he spiritually adopted her as his daughter, we renamed her Harmony Rae. Also during our retreat, God revealed to us the child we miscarried was a boy, so we named him Dawson Alexander. As our pastor has said in church many times, "God doesn't waste a single hurt". Pastor's words of wisdom and my experience have given me insight of God's plan for my life. I know my life's calling is to be a pro-life advocate and teach others about God's grace, love and forgiveness after having an abortion. December 2005: Nearly a year after we lost Dawson, we discovered we're pregnant, again! The baby is due August 6th, 2006. May 2006: I received a phone call from a number in the Virginia Beach area that I didn't recognize. I later called it back and hung up once I realized it was Andre. Andre called my cell phone back after I hung up the phone. Damon called him back to ask why he called. Andre stuttered and said he must have dialed the wrong number. I called Andre's commander the next day to get this settled once and for all. He was served a no-contact order by his commander, and the contact has finally stopped. August 2006: On August 2nd, our son made his arrival into our family. He's an absolute joy, and we are so thankful for God blessing our family by sending him into our lives. I have had 4 abortions. I have a history of addiction. All of this from the time I was 18-30 years of age. I felt that I was a loser, that I had nothing to offer anyone. I did get clean, got married when I was 32 and had 2 sons but I still didn't feel good about myself or deserving of my husband or children. I had buried the abortions so deep inside of me that I never even considered that could be part of my problem. I always felt like a fake, that I could never really be honest because if people knew who I really was, they would think I was a terrible person. My mother was Catholic. She never knew of the abortions. 20 years ago, I stopped going to church. I had my boys receive their first holy communion but never attended church again. Last year, 2009, I decided to go back to mass as my New Years Resolution. I felt empty and knew that I had pushed God out of my life. I cried at every mass I attended. It was so embarrassing to be crying at mass. One Sunday, I noticed in the bulletin that there was a retreat called Rachels Vineyard that was for woman who had abortion(s). I called them up and made arrangements to go which I did. At the time, I began to think that quite possibly God quietly had me go to mass so that I would find Rachels Vineyard. I can only say that it was a weekend of transformation for me. A weekend of taking responsibility for my actions, a weekend of being forgiven and a weekend of allowing the beautiful people to care and love me like I had never known before. Today, I am going back to the same retreat so that I can offer support and comfort as it was so freely given to me. So that I can help set up and clean up. Rachaels Vineyard has given me the opportunity to be loved and love. To know that Jesus forgives me and loves me and that my children are with him and being loved and cared for. Many years had passed, and I had confessed many sins, before I finally heard a homily by Father Larry Richards that discussed the true blessing of the sacrament of Confession. At the end of the CD, he went through an examination of conscience. I nearly froze in my steps when he said, “If you’ve had an abortion, confess it—your baby in Heaven is praying for you.” My eyes immediately filled with tears as I went straight home to make a list of things I needed to discuss with my priest. Chest heaving with sobs in the confessional, I told Father Roux that I had had an abortion 12 years earlier. He smiled kindly, held out a box of tissues, and assured me that the sin would be absolved. However it was clear that I needed more than absolution—I needed healing. Father Roux told me about Rachel’s Vineyard, a ministry devoted to helping counsel women who suffer from Post Abortion Syndrome. Did you even know there was a name for what we feel? Because I had NO IDEA, and learning about Rachel’s Vineyard, coupled with the fact that clearly there were enough women suffering silently with me, seemed to lift an enormous burden. I went home to research Rachel’s Vineyard, and sent a couple of emails to the contacts listed on the website. But I slowly started to discuss my experience more openly with my husband. I also became involved in a letter-writing campaign asking corporations to quit supporting Planned Parenthood, America’s largest provider of abortions. Eventually I felt like I had come a long way and that maybe I didn’t need to attend a Rachel’s Vineyard retreat after all. Practically out of the blue one day, I received an email from the Catholic News Herald asking if they could publish a piece about my efforts to defund Planned Parenthood. I hesitated, wondering if I wanted to wear that scarlet “A”, but ultimately decided that if nothing else, maybe I could recruit more people to my letter-writing campaign. Not long after the article ran in January, I received an email from a complete stranger who also attends the same parish as me and my family. She said that she had suffered silently for years from abortion and wondered if we could meet. My heart lurched. While I was thrilled at the opportunity to help someone, I felt enormously unqualified to do so. When we finally met (and wept), we had decided that we would attend a retreat together. We looked at dates, and decided that sooner was better than later, so we would attend the very next retreat available—a weekend in March in the Savannah diocese. Knowing myself, I feared that I would get cold feet and cancel at the last minute, so I booked a flight from Charlotte to Savannah. I encouraged my new friend to do the same, but she decided it was best that she drive. In another attempt to keep myself honest, I told Father Roux that I was planning to attend a retreat (nearly a year and a half after his recommendation) so that if he saw me in Mass that weekend it would be obvious that I was too scared to go. As the date neared, I became more and more hesitant to go. Eventually my friend told me that she didn’t feel ready to re-open her wounds by attending a retreat. My initial reaction was, “well if she’s not going, I’m not going! I only registered to help HER!” How very naïve of me! Finally it was time for me to pack up and head to Savannah. My Mom came to my house to take care of my young son, and asked me how I was holding up. I couldn’t control the tears that came in reply to her question. I hadn’t packed and was already considering holing up in some hotel in Savannah and just resting alone for the entire weekend. But I slowly packed and after much distraction, we left for the airport. I have never spent so much time in the security check point! This was when I was resigned to the fact that I would never arrive at my retreat. But I wasn’t upset. I thought about renting a car and going to Savannah, and I also thought about checking into the Ritz uptown and just taking a break from real life for a couple of days. When I finally got through security, the gate for my flight was closed. As I ran to the counter, the US Airways employee looked at me and said, “Rebecca Griffin?” I was so embarrassed at being so late and somehow he was able to ask the crew to wait for me. Just when I thought I was off the hook! I boarded the plane and immediately saw the one vacant seat, which wasn’t mine. I had gone online the night before and paid the extra eight dollars to have a “premium” (or window) seat. But there was an enormous man in the seat I’d paid for. So I asked, “Are you 3B?” To which he said, “No.” The stewardess told me to “just sit down” because we were ready to take off. So I looked at the man and said, “I paid EXTRA for that seat, which is why I asked!” He couldn’t care less, and I was fuming. Over eight dollars. This really is not who I am. (Fortunately I was able to go to Confession during the retreat and the priest and I had a good laugh over my ridiculous behavior.) But this is how uncomfortable I was about making myself vulnerable in front of a group of strangers about the most disgusting experience of my entire life. I absolutely did not want to go. I tried to read “Forbidden Grief” on the plane, but it was too excruciating, so instead I prayed. I prayed for the man in my seat. I prayed for my aborted child. I prayed for all of the women who might attend the retreat with me. I prayed for women who have been through abortion and don’t know that there is healing available to them. I prayed for every person I could think of, and finally I landed. Picking up my rental car, the gentleman behind the counter asked where I was heading. I told him, and he said, “Chicken country!” Yeah, that’s what I needed to convince me to go… I was still thinking about a weekend alone in Savannah but decided to trudge forward. On the road, I reached into my purse for my sunglasses and found that one of the hinges had come undone, rendering them useless. Of course. I hadn’t printed an itinerary, so not only was I unsure of where to go, I also didn’t know what time to get there. Of course. I called the only contact number I had and went straight to voice mail. Of course. So I pulled over and had lunch. The chicken was delicious, and I figured, “Of course! I’m in chicken country!” Ugh. I drove through a couple of very humble towns, still unsure of any landmarks and very sure that I was going the wrong way. When I finally spotted the balloons on the fence that would indicate where I needed to be, I thought I wanted to vomit. My head was killing me. I wanted a posh bed, a bubble bath and a glass of wine. But I found a sweet smiling woman on the porch. I felt like once she spotted me, I couldn’t turn back. I thank God for her. The team was still preparing for everyone to arrive; I was a couple of hours early. Fortunately that meant I could attend Mass on Friday afternoon. I waited silently in the chapel. The priest walked by and said hello, and asked how I was doing. Involuntarily my eyes turned into waterfalls. He smiled and said, “I know. But you’ll feel better soon. I promise.” I think I cried from my arrival at 4 pm until I went to bed at 11:00. I read the packed schedule thinking that this was immature and that I still might sneak away, but with each exercise I actually felt a little bit better. The first night, after we had been very well fed, we had our first “Living Scripture” experience. I must admit that when I saw this on the schedule I thought it was nothing less than stupid. Except that it revolved around my favorite piece of scripture: John 8:1-11. “Has no one here condemned you?” “No one, Lord.” “Neither do I condemn you.” This was such a revelation for me: of course none of these women would judge me for having an abortion! We were all there to find forgiveness and healing, and none of us would DARE judge another one of us. This opened the flood gates and I was finally free to discuss my experience, along with the guilt and shame and regret, with a group who wouldn’t even consider passing judgment. Thank you, Lord! We were up and going early on Saturday, which is NOT normal for me. My husband gets up with our children on Saturdays so that I can sleep. When my alarm went off at 6:30, I was startled, but I was also pleasantly surprised at how rested I felt. This might not be so bad. When I walked into the dining room, everyone commented on the “New Brice.” They told me I was not the Brice that was there the night before—bitter, arms crossed, weeping (again, this is NOT me!). I was a smiling Brice. It was a good start. I felt better already. Saturday was our opportunity to “tell our story.” Never in my life had I had the opportunity to do this. Why would I?! From my parents’ (nasty) divorce when I was five to my present day, it all fell into place. Listening to the stories of all of the other participants (two men included), there was one common thread: each of us came from a broken home. No two stories were the same. As for me, my parents divorced when I was five. That was in 1980. To this day, they have not spoken to each other without an attorney. They share two children and five grandchildren. Weddings, Baptisms, First Communions, … nothing is important enough for them to realize the damage that has been done to our family. Or maybe they have realized it and have become bitter because of it. Anyway, I spent several years seeking attention wherever I could get it. Tattoos, booze, boys, bands, whatever. I had no spiritual foundation and certainly no respect for the sanctity of life. So when I found myself knocked up by my rock star boyfriend, I didn’t even flinch when he said, “Well let’s take care of it.” Phew. Of course that’s what we would do. Because he said so. I mean, who else would I turn to? I was young and impressionable and I had the CHOICE to do whatever I wanted. On Sunday we had a lovely memorial service for our lost children. After naming them, we had the opportunity to write them a letter to tell them anything we might be feeling. Everyone apologized to their child. Everyone begged for forgiveness. Everyone wept. While I now feel a great sense of peace and healing, in retrospect I am stunned. Disgusted that no one ever told me that there was a child in my womb. Dumbfounded that the abortionist actually made small talk with me (his daughter liked the same bands as me and was going to see our favorite that very night). THE ABORTIONIST WAS THE FATHER OF A GIRL. This kills me today. I pray that she never became pregnant unexpectedly and he aborted his own grandchild. I am horrified that the pro-abortion movement does not acknowledge the damage done to a woman (or a man) when they go through an abortion. Nothing in this world could ever make me feel like I made the right decision. But attending a Rachel’s Vineyard retreat helped me to realize so many things: I am not alone; God forgives me because I have contrition; and most importantly, my child forgives me. My little boy is waiting for the moment when I can hold him in my arms and tell him about all of his siblings, and how much we love him, and how I have missed him. Rachel’s Vineyard has given me so much more than healing. It has given me an ability that I never had before, to be able to vocalize exactly why I am adamantly pro-life and why I will raise my kids to be the same. I would never wish this experience upon anyone, and I want the world to understand that there is no such thing as an unwanted child. Leaving the retreat on Sunday, I was a new woman. Finally, after nearly 13 years, I had closure. I had peace. I felt that my God and my child had forgiven me. I had ten new friends, all of whom had suffered what I had suffered—some of them multiple times—and all of whom were now on the road to recovery. Not a day passes that I don’t think about my abortion, and about how my life would have been different if I had made the other decision. And now, thankfully, not a day goes by when I don’t thank God for Rachel’s Vineyard. After making me lie down for 30 minutes, another nurse dismissed me. I tried to tell her how much pain I was in and what had happened. It was as if I had said nothing. Painfully and slowly, I dressed and walked into the waiting room. I looked at A. He looked at me. If I had had a weapon, he and everyone else in that clinic would have died, myself included. My feeling for him were far deeper than mere hatred. I fantasized about annihilating him (somehow), making him beg for mercy first., as I had in the clinic. Finally, even my hatred drained out of me, leaving only a despairing blackness. I was at the end of the road, with no salvation for the likes of me. I had finally struck bottom. With quiet deliberation, I took my handgun from under my pillow, checking to make sure the clip was loaded. I chambered a round, walked into my living room, sat in a chair, put the gun to my head and pulled the trigger. To this day, I cannot think why the gun did not fire. I had always kept it in perfect working order. Still numb, I called my only friend, S., and told her what I tried to do. She lived quite a distance from me, but she was there in only a few minutes; under five, I think. She put me on her lap like I was a child and rocked me for a long time. I cannot describe the healing I have received from being present at that wonderful retreat. Thanks to Rachel's Vineyard retreat I can look in a mirror without hating the reflection I used to see. Thanks to the wonderful counselors on that retreat, I can say "I healed, I am loved, I am saved by my Redeemer and truly know it." After two abortions I felt very alone, depressed and confused. I never knew what was wrong with me. I would cry and cry, I would cut myself or burn myself on the oven racks, I would punch and bruise myself. I was out of control, and when anyone would ask me, "what's wrong?" I honestly answered "I don't know." I felt as if I were going insane. Who cries all the time and hurts themselves without knowing why? I was always feeling numb when I would hurt myself. It was like the pain would help wake me up. I hated myself. Years of counseling did not help, anti-depressants did not help, nothing seemed to help. It was all kept pretty much a secret. Only a select few knew of my extreme depression, hurting myself, and of my abortions. Finally, after years of this torture, I told my dad everything. I told him of the abortions, sleeping around, drugs I had been doing to get me through, and of the abuse inflicted on me by myself and the others. He shocked me by being there for me. He understood why I did what I did. He sat with me as I told my mother and she also shocked me when, instead of being mad at me, she hugged me and cried and said that she wishes she could have been there for me. These are reactions I never expected. But, the depression and self abuse did not stop. My father, who is a counselor himself, tried everything he could to figure out what was wrong with me. He sent me to more counseling, which did not seem to help. My father wanted more than anything to figure out how to help me. Finally, at a meeting he attended, he met a woman named Teresa Burke, Ph.D. She was talking about people she had met with many of the same symptoms I had, and that they also could not figure out what was wrong with them. Theresa began to realize, that sometime in the past, each of these women had had an abortion. My father listened and learned that they would be holding a retreat for people who had had abortions. The retreat would be a way of letting go of guilt and maybe to feel better. When my father told me about the retreat, I have to admit, I just thought, what the hell, I'll try it, but that it would not change anything, just as nothing else had. I felt this way straight up to when I arrived at the Abbey for the weekend retreat. It was nice, but I still felt it was not going to change my depression. Saturday night a few people offered to come to my room to talk to me and pray with me. I cannot describe what happened that night. For the first time, I actually pictured my children in heaven with God, and with my grandmother who passed away, and they were happy. They were drawing me in to God's love and forgiveness. That night, I knew God existed and that I am not a terrible person, and that I have already been forgiven by God and my children. It was overwhelming. Never had anything like this happened before in my life. I cannot begin to describe on paper, the wonderful sense of peace and love I felt that night. Nothing like that has ever happened to me before. On my 15th birthday, I was almost three months pregnant. It mattered little to me that my father wanted me to have an abortion and vowed not to let me live under his roof once I started to show. After all, my boyfriend and I were in love and he said he wanted to marry me; that was all that mattered to me at the time. But this changed in weeks to come as my boyfriend had a change of heart and told me that he thought it was best that we didn’t marry. But what was not clear to me, was what he thought was best. In fact, no one in my life at that time, except my father, seemed to have an opinion of what was best. I had a vague idea that there were alternatives to abortion but by then I felt that I didn’t have the strength, courage or heart to explore them. Nor was anyone else in my life encouraging me to do so. And my boyfriend for the most part was no longer in the picture. So with a broken heart, I listened to my father. On the day of my abortion, it was my mother, not my father who took me. Looking back, I wonder what my mother thought. Did she think it was wrong? Did she ever regret not seeing her grandbaby? I will never know. But she was there with me silently carrying out my father’s wishes. At 15, I was oblivious to the moral and political controversy over abortion. And since we didn’t go to church, I didn’t hear what the church had to say either. And yet, intuitively I knew it was wrong. The last thing I remember that day was being on the abortion table before it took place crying out loud for my baby. Thinking about this now, I don’t know how that abortionist could have proceeded knowing that I obviously didn’t want to go through with it. In my father’s view, my life should have gone on as if nothing ever happened. I tried to go back to school but wound up dropping out. Some other students, whom I didn’t even know, made it a point to tell me what a horrible thing I had done. At first I tried to defend my “choice” but I knew it was wrong. In fact, I felt overwhelmed with guilt and shame. Still life had to go on. And thank God it didn’t occur to me that my life didn’t have to go on because if it had occurred to me, I probably would have ended it then. For the better part of 37 years, I did an excellent job of avoiding the subject of abortion; including my own. I believed that what I did was terribly wrong. I asked God for forgiveness and then left it at that. Any further examination was just too painful. Looking back over the years, I believe that my pain caused me to make many self-destructive decisions including decisions that prevented me from the joy of having and raising children. About 30 years ago I started going to church regularly. And when the church teachings on abortion would come up, I would silently agree but never speak up. I felt that I had no right to say anything because of what I did. The beginning of the end for my long lived avoidance came one Sunday during mass. Abortion came up many times before from the pulpit, but this time was different. The priest actually said that if we voted for a pro-choice candidate, we would go to hell. Right or wrong; church teaching or not; was not the point for me. The point for me was that I needed to stop avoiding the subject of abortion. But how? I started with prayer. Daily I would (and still do), pray for an end to abortion, victims of abortion, and those in crisis pregnancies considering abortion. This and this alone went on for about two years. Then, during another Sunday mass (different parish), the priest mentioned Rachel’s Vineyard. I remember thinking how nice it was that there was help for others but didn’t think it was for me since my abortion was so long ago. A couple of months later, my husband and I saw the movie Heaven is for Real. When the little boy met, in heaven, his older sister who had been lost in a miscarriage, it struck me like never before that my baby too was in heaven. And I grieved like never before for my own child. It was then that I knew I needed healing and had to find out more about Rachel’s Vineyard. In Sept 2014, I attended a Rachel’s Vineyard retreat. The experience of the retreat caused me to feel as if I had been released from prison; a prison of isolation, guilt and shame. Through prayer, sharing, spiritual exercises and confession, I experienced God’s mercy and forgiveness move profoundly than ever before. But the healing hasn’t stopped there. Through Companions on the Journey, sharing with others continues to keep me out of isolation and encourages me to grow and help others as well. Perhaps the most precious gift I received from the retreat is that, for the first time in 40 years, I have a spiritual relationship with Noah, my aborted son. I never knew that this could be possible. And although I didn’t have this relationship for so long, it now seems impossible to imagine life without him. The amazing truth is that he has been there this whole time; in my pain, I just didn’t realize it. I am deeply grateful to God and to Project Rachel family for my healing and for the spiritual relationship I now have with my son. Thank you and God bless. I registered for my Rachel's Vineyard retreat believing that I had received all the healing I needed at previous healing experiences. I was planning on becoming involved in the ministry of post abortion healing and I thought it help me to go through a retreat. As the retreat began I started to feel the grace of unity amongst my fellow sister retreatants. We shared our stories of our abortion or abortions with candor and humility. Each part of the weekend brought with it a sense of renewal and mutual respect for each other. The road that had at one time been so lonely and isolated was now filled with those who had been walking with me but walking apart. The different levels of healing that were touched in me during the weekend will take me a lifetime to absorb. When the retreat ended it was diffcult for us to part.P ost abortive women share a common wound and those wounds are joined to others during a Rachel's Vineyard Retreat. It is no longer necessary to feel alone because the bonds that were created during the weekend will be eternal. I thank Theresa and Kevin for their willingness to delve into the depths of abortion trauma and give us a way to heal. 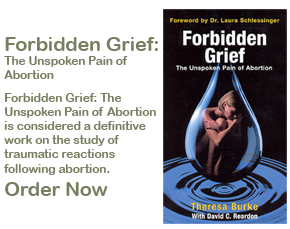 experiencing the tragedy of abortion impacted negatively my life and left me in the dark for many years. I battle addictions ,psychological disorder, became a monster hurting myself in every imaginable way possible. I was able to face my reality and walk through an effective healing process @ the vineyard , i received the tools to face society, my church,fam and myself with the reality of the abortion. Im a new woman empowered by the love & mercy of God working on becoming a better human being spreading the love &mercy of our Lord and speaking on behalf of those who have no voice. God still there after abortion. Self forgiveness, a personal encounter with god & hard work with love,will be enough to allow another child to be born,and every person touched by this tragedy to heal. Esta es una carta que una mujer despues de recivir la sanacion del retiro EL Viñedo de Raquel, compartio con nosotros en la reunion despues del retiro. En el retiro tenemos la oportunidad de escribir una carta a nuestros hijos perdidos por haber tenido un aborto, son nuestras palabras de madres (padres) las que escribimos a nuestros hijos. Esta es una carta que se ecribio ella de parte de sus hijitos que estan con Jesus, despues de el retiro, como una contestacion a su carta ,de parte de sus hijitos. Recibimos tu carta apenas terminastes de escribirla. ¡Fue entrega inmediata de Corazon a Corazon! Mami queremos que sepas que por muchos años esperamos este momento de alegria, recibir carta tuya. ¿Cuantas veces le preguntamos a Jesus cuando mi mami nos va a escribir? Queremos guardar algo de ella en nuestros corazones. Y Jesus nos consolaba diciendonos “algun dia escuchara el llamado de nuestro Padre Dios, y sera un gran dia”. “Bueno dijo Jesus, ¿que quieren decirle?”. Querida mami, hubieramos querido quedarnos contigo aunque sea un tiempecito, para saber como son las madres en la tierra … cuando decidistes separarte de nosotros. nos sentimos muy tristes, lloramos mucho, te gritabamos ¡Mami Mami!, no nos alejes de ti, no sabemos a donde, vamos tenemos miedo... Ya eramos tus bebitos. No nos oias, ni sentias lo agitados que estabamos. ¿Que te hicieron que estabas tan ciega de dolor, o de rabia que no pensastes en nosotros, que podriamos ser tu refugio tu consuelo tu razon de vivir...? Nos quedamos calladitos por un ratito, y tu querido Jesus (como tu lo llamas), que no le gusta ver a las personas tristes y es un gran consolador, nos dio un abrazo ¡que abrazo mami tan dulce!. Cuando tu necesites uno, llama a Jesus. “Sigamos escribiendo”, nos dijo tu querido Jesus. Mami, cualquiera que fuera la razon, queremos que sepas que ya te perdonamos y te queremos mucho; el dia que tu nos mandastes la carta sera como nuestros cumpleaños, sera una fecha muy especial para nosotros y para ti tanbien ¿verdad mami? Mami nosotros le prequntamos a Jesus si los hijos segun sea el padre tienen lugar de rango en el corazon de una madre; ¿verdad mami que para ti todos somos iguales?...nos abrazamos a Jesus y le preguntamos: ¿tu nos quieres a todos verdad? ……Y nos miraba callado hasta que abriendo los brazos…dijo. “!Yo los amo asi a todos por igual!”. En ese momento conprendimos que no fueron los clavos fue el gran amor que sostuvo a Jesus en la cruz por nosotros. Mami recibe nuestro perdon y amor y nuestro agradecimiento a tu querido Jesus por recibirnos en su casa y enseñarnos a perdonar ,.....dale un abrazo a nuestro hermano mayor, y dile que nos hubiera gustado jugar con el......! Estaremos esperando por ti..besos muchos besos de tus bebitos . Pd. ¡Y recuerda 5 de Marzo nuestra fecha especial!